Colorful stars in the open cluster IC 4651 3,000 light-years from Earth shine in this image taken at ESO's La Silla Observatory in Chile, using the MPG/ESO 2.2-metre telescope. A middle-aged clutch of stars shines in many colors in a new view of deep space by a telescope in Chile. The stars in the image are from an open star cluster called IC 4651, which lies in the Milky Way about 3,000 light-years from Earth. Astronomers used the La Silla Observatory in Chile, part of the European Southern Observatory, to capture the sparkly view. ESO astronomers created a video of the star cluster to showcase the image. Over time, however, gravity will shift the gas, which will also be used for more star birth, setting the stars free. This has already started to happen. While astronomers recently found that IC 4651 has a mass 630 times that of Earth's sun, it is believed that the cluster contained 8,300 stars when it formed, with a total mass equivalent to 5,300 times that of Earth's sun. "As this cluster is relatively old, a part of this lost mass will be due to the most massive stars in the cluster having already reached the ends of their lives and exploded as supernovae," ESO officials wrote in an image description. "However, the majority of the stars that have been lost will not have died, but merely moved on. They will have been stripped from the cluster as it passed by a giant gas cloud or had a close encounter with a neighboring cluster, or even simply drifted away." 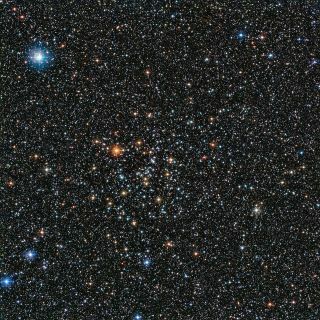 The cosmic neighborhood around the open star cluster IC 4651 is filled with stars of all types. This shows a wide-field view around the cluster using images from the Digitized Sky Survey 2. The bright star on the the left is Alpha Arae, one of the brightest stars in the constellation of Ara (The Altar). The image was obtained using the Wide Field Imager that is mounted on the MPG/ESO 2.2-meter telescope at La Silla Observatory. The Milky Way has thousands of star clusters of this type. Scientists think that the sun formed in a cluster such as this one, but over time drifted away from its cluster. Studying the clusters allows astronomers to test their hypotheses of how the sun was formed.